Goibibo is one of the largest online hotel and air-travel booking websites in India. It is also the number one ranked mobile app under Travel category. In 2015, their hotels-booking volumes grew 5x YoY, with 70% of them coming from their mobile app. Goibibo was setting up a Disaster recovery environment for their production workload on AWS cloud in a geographically isolated region. Their primary environment being on AWS Cloud the intention was to have as many data sources in sync and available at DR location to handle traffic in case of disaster. The client maintains a set of Amazon ElastiCache clusters which needs to be available in the DR region in the event of a disaster. Amazon ElastiCache, unfortunately, does not support multi-region slaves so it had to be a traditional snapshot and restore at scheduled intervals at the DR region. The client was also maintaining a set of Amazon ElastiCache Memcached instances which had to be created at the click of a button. 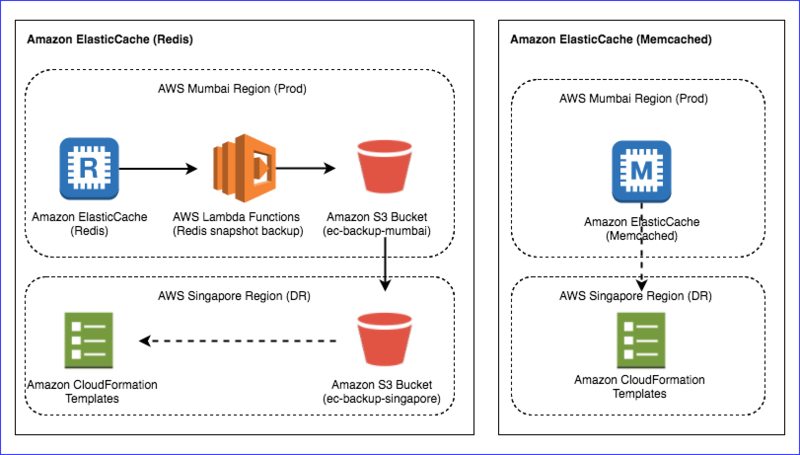 We are using AWS Lambda , Amazon S3 and AWS CloudFormation to automate the Disaster Recovery (DR) setup. Amazon ElastiCache: It’s an in-memory storage layer between the application code and the database supports the Memcached or Redis engines. These will helps in speeding up the access to databases. Memcached: It’s an open source, high-performing, distributed memory object caching system developed in 2003 with the initial goal of speeding up dynamic web applications by alleviating database load. Amazon Simple Storage Service (S3): It's a web service offered by AWS. AWS S3 minimizes outage impact . It stores data as objects within resources called "buckets". A user can store as many objects as they want within a bucket, and write, read, and delete objects in user bucket. Objects can be up to 5 terabytes in size. AWS CloudFormation: It gives developers and systems administrators an easy way to create and manage a collection of related AWS resources, provisioning and updating them in an orderly and predictable fashion. We have Amazon ElactiCache (Redis) production clusters configured in the Mumbai region. We have the AWS Lambda python scripts; one to create a snapshot of all the redis clusters having snapshot name suffixed with the current date and another script to describe the redis clusters and iterate through each cluster then describe the snapshots associated with the cluster instance and try to find the current date in the snapshot names which are copied to the Amazon S3 bucket (ec-backup-mumbai) specified in the same region. After that; it describes all the snapshots associated with the cluster instance and tries to find the date with time delta older than days in the snapshot name to retain the snapshots and delete the older snapshots. We have versioning enabled in the source region Amazon S3 bucket (ec-backup-mumbai) and also, we have enabled Cross-Origin Resource Sharing (CORS) with the DR region Amazon S3 bucket (ec-backup-singapore) to sync the snapshots. We have created the Amazon S3 rule for both the prod and DR Amazon S3 buckets to delete the objects older than 7 days in order to save the storage cost. Memcache doesn’t support data persistent to the disk. Hence, we need to create the new cluster with the cloud formation templates as same as production cluster configurations. We should have the Amazon VPC, Subnet group, parameter groups and security groups recreated in the DR region as same as production. The AWS CloudFormation template should have kept up-to-date with the production clusters configuration. Nagarjuna D N is an AWS SysOps Certified, with 3+ years of experience in IT Infrastructure, currently working as a DevOps Engineer at BluePi. Key areas of interest include Cloud Computing, Databases, Open Source Technologies, Infrastructure-as-a-Code, Data Center Migrations and Server Automations.